Did you miss Gymkhana sensei Ken Block take James May for a spin a few hundred spins on last night's episode of Top Gear? No need to cry. We've scoured the interwebs and found the clip for ya! 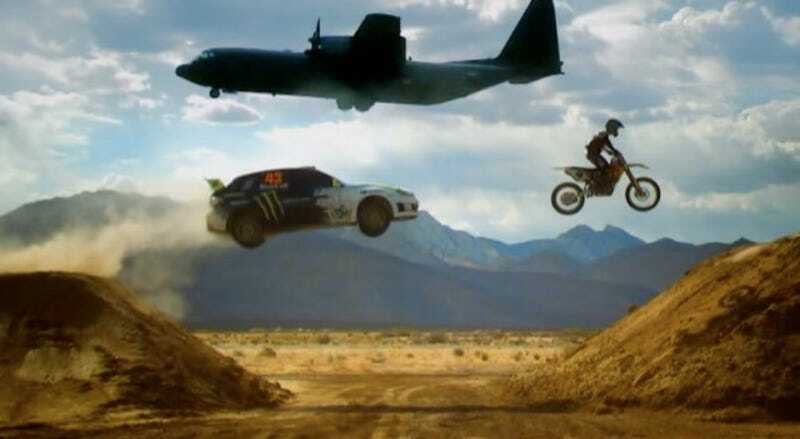 Ken Block&apos;s Gymkhana Practice Video Reveals "Big Oops"
Ken's a master of sliding sideways in his specially-equipped Subaru. And as you can see, he gives May the ride of his life — even if he doesn't have the guts to say it. And by guts, we mean of course playing his role as the anti-stereotypical "Captain Slow" by decrying his inability to drive fast in a straight line. Whatever — USA! USA! USA! And on a personal note, we're glad to see even Top Gear's fabulous production team's taken to adding a bit more Planelopnik into their shot selection. Jolly good show, chaps!